b = firlpnorm(n,f,edges,a) returns a filter of numerator order n which represents the best approximation to the frequency response described by f and a in the least-Pth norm sense. P is set to 128 by default, which essentially equivalent to the infinity norm. Vector edges specifies the band-edge frequencies for multiband designs. firlpnorm uses an unconstrained quasi-Newton algorithm to design the specified filter. f and a must have the same number of elements, which can exceed the number of elements in edges. This lets you specify filters with any gain contour within each band. However, the frequencies in edges must also be in vector f. Always use freqz to check the resulting filter. firlpnorm uses a nonlinear optimization routine that may not converge in some filter design cases. Furthermore the algorithm is not well-suited for certain large-order (order > 100) filter designs. designs a lowpass filter with a peak of 1.6 within the passband, and with emphasis placed on minimizing the error in the stopband. b = firlpnorm(n,f,edges,a,w,p) where p is a two-element vector [pmin pmax] lets you specify the minimum and maximum values of p used in the least-pth algorithm. Default is [2 128] which essentially yields the L-infinity, or Chebyshev, norm. pmin and pmax should be even numbers. 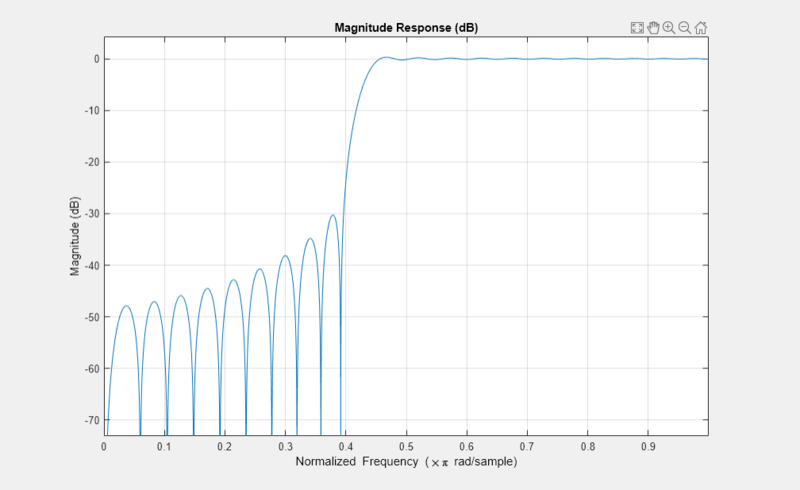 The design algorithm starts optimizing the filter with pmin and moves toward an optimal filter in the pmax sense. When p is set to 'inspect', firlpnorm does not optimize the resulting filter. You might use this feature to inspect the initial zero placement. b = firlpnorm(n,f,edges,a,w,p,dens) specifies the grid density dens used in the optimization. The number of grid points is [dens*(n+1)]. The default is 20. You can specify dens as a single-element cell array. The grid is equally spaced. b = firlpnorm(n,f,edges,a,w,p,dens,initnum) lets you determine the initial estimate of the filter numerator coefficients in vector initnum. This can prove helpful for difficult optimization problems. The pole-zero editor in Signal Processing Toolbox™ software can be used for generating initnum. b = firlpnorm(...,'minphase') where 'minphase' is the last argument in the argument list generates a minimum-phase FIR filter. By default, firlpnorm design mixed-phase filters. Specifying input option 'minphase' causes firlpnorm to use a different optimization method to design the minimum-phase filter. As a result of the different optimization used, the minimum-phase filter can yield slightly different results. [b,err] = firlpnorm(...) returns the least-pth approximation error err. 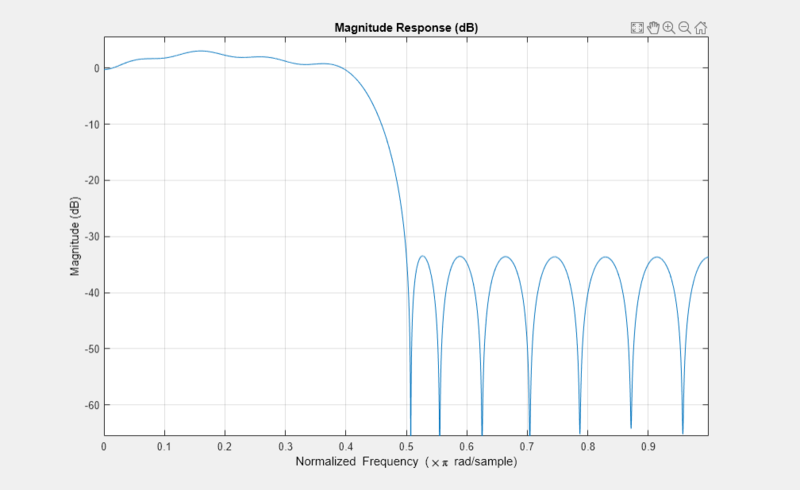 Lowpass filter with a peak of 1.4 in the passband. The resulting filter is lowpass, with the desired 1.4 peak in the passband (notice the 1.4 specified in vector a). Highpass minimum-phase filter optimized for the 4-norm. This is a minimum-phase, highpass filter. 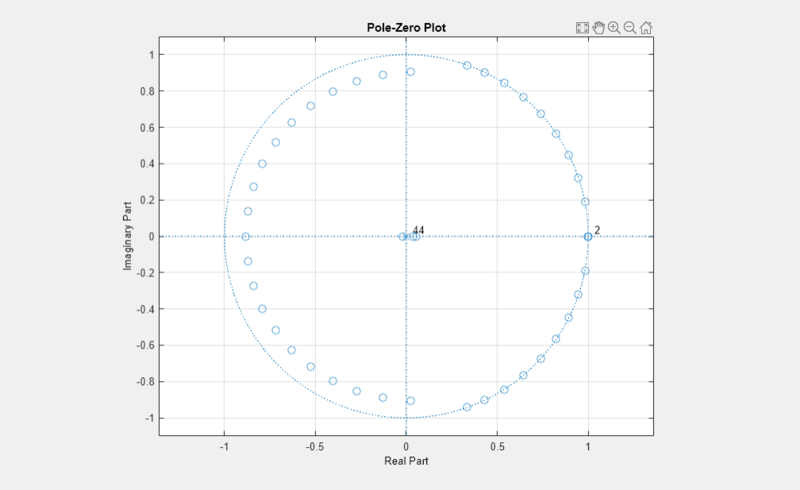 The zero-pole plot shows the minimum phase nature more clearly.